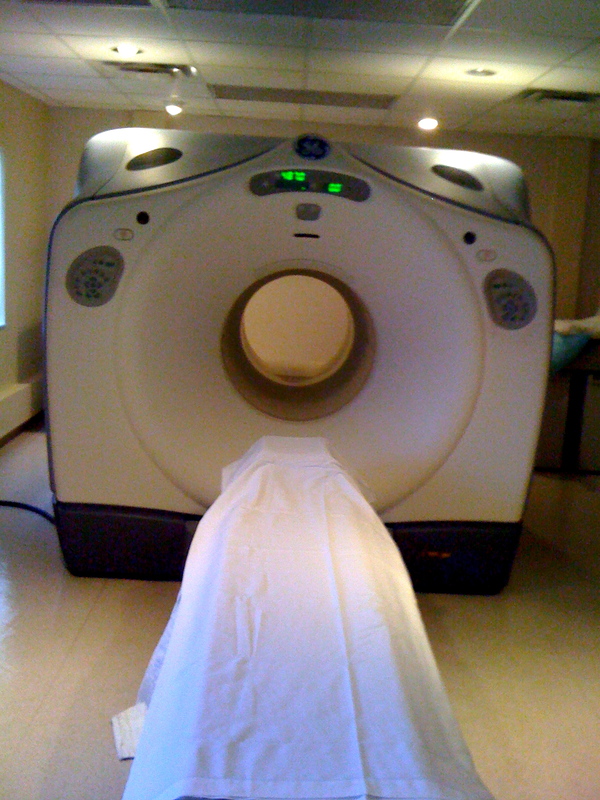 The CT/PET machine that scanned me today. Today marks 18 months since the end of my treatments for squamous cell carcinoma. I celebrate every 6 months by getting a CT/PET scan to check for more cancer. This is a routine that most cancer survivors are familiar with, but surprisingly few others understand. This article is my attempt to explain the process to the uninitiated. After a cancer patient completes treatment and is nominally cancer-free, there is always the danger and risk that the cancer is still there; just too small to be detected. As early detection is the key to fighting cancer, your doctors will schedule bi-annual CT/PET scans to check for new malignancies. For the first two years, these tests are usually scheduled every six months and typically yearly after the first two years. Both CT and PET scans are used to generate three-dimensional images of the internal structures of your body. When the CT/PET scan is completed, the 3D image is analyzed by a doctor who is familiar with your medial history. Obviously, he is looking for a new growth. We always hope he doesn’t find one. My scans are scheduled 6 months in advance. I know exactly what date I will be returning for my scans and I plan accordingly. These machines are very busy – there are a lot of patients – so it is important to not miss your date. Getting your scan is vital and to miss a scheduled scan is a huge risk. Rescheduling is problematic as well – your oncologists tend to schedule THEIR follow-ups with you right after the scans, so you can review what action plan you need going forward. Missing your scan and rescheduling it causes a daisy chain of rescheduling that can be very difficult to manage. The night before a CT/PET scan, up until the scan itself, you can’t have any caffeine, food, alcohol, or nicotine. You can probably imagine the anxiety leading up to this point. If you’ve read my blogs, you know that I start getting nervous about 30 days out. To live cancer free is a gift that one doesn’t appreciate until you have faced that demon and beaten it back. You develop a strange ambivalence towards the entire scan process. On the one hand, you are eager for it because you want the assurance that you are till cancer-free. On the other hand, you are dreading it because you may find out that you have a recurrence. This anxiety wreaks havoc on cancer survivors, and friends/caregivers need to recognize and understand this. The nurse gives you an IV to prep for the radioactive solution that will be injected into you. I’m always a bleeder. Once you arrive at the imaging center, you are led back to a small room where your medical history is verified. The nurse verified my type of cancer, the location, the number of chemo treatments I had, the length of my radiation treatments, the number and dates of biopsies and surgeries, as well as confirming that I had not had any other scans recently. This is important; CT/PET scans are radioactive and for safety reasons you should only have so many per year. The room is usually small, cozy, and has soft music playing in the background. You are led to a recliner and a pillow is placed under your arm. 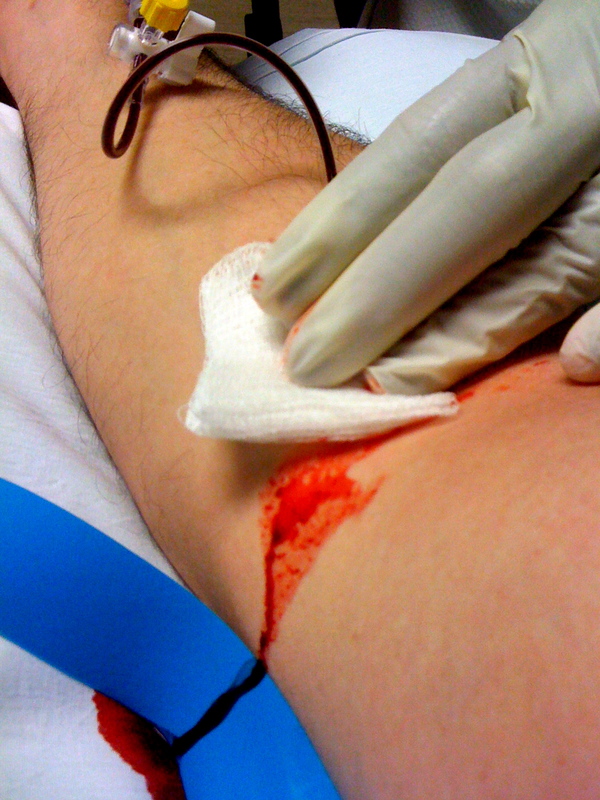 A tourniquet is wrapped around your arm and the nurse washes her hands and then tries to find a viable vein to insert an IV into. In order for the CT/PET scan to work properly, a small amount of radioactive liquid needs to be injected into your body. That is the purpose of the IV. Today, in my case, it did not go as smoothly as I would like. 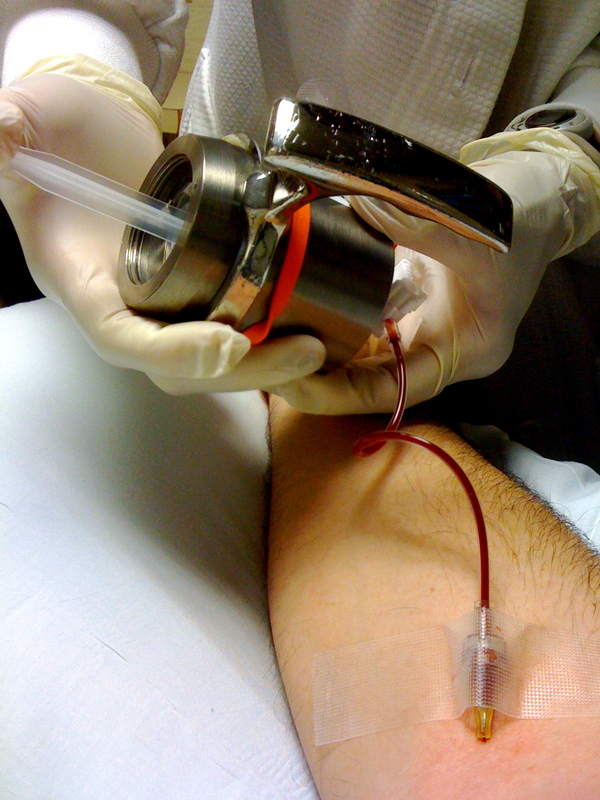 When I get stuck with a needle I tend to rather forcefully squirt plasma everywhere. I warned the nurse that this was the case. I always warn them. They never listen. They smile, assume that I am exaggerating, and obliviously stick me anyway. So I had my camera ready; I knew what the outcome was going to be and as my Type AB+ blood spewed forcefully from my vein, I captured the moment digitally. Truthfully, this nurse was quicker than the last one six months ago. I only squirted a couple of teaspoons this time; last time I lost a lot more before she managed to get it under control. After the IV is successfully administered, the nurse pushes through sterile saline to clear the IV and then performs a blood sugar test on you. The radioactive liquid that comes next is in a sugary solution and will raise blood sugar levels accordingly. If your fasting blood sugar is above 130-150 the nurses may postpone your scan until you have a more reasonable blood sugar level. In my case, my fasting blood sugar was 110. I was ready to go. The nurse handed me an 8-ounce cup of “contrast.” The contrast is a iodine-based solution that works its way through your bowels. It is used by the CT scan to, as the name suggests, provide contrast in the scan. It makes your intestines and bowels easier to see in the scan. It tastes foul. Many people gag and can barely tolerate it. For me, it’s not that bad, a little chalky, and I take a deep breath and swallow it all in one massive gulp. The downside of the contrast is that it induces diarrhea in many people; myself included. To avoid social awkwardness, it is usually best to work from home after your scans so you can be close to the porcelain throne. After I made the appropriate faces from drinking the contrast, the nurse left and returned with the radioactive liquid. This liquid is not stored at the imaging center. The imaging center sends a list of patients each day to the supplier and a daily delivery is made. It is regulated and dangerous and there is never more than enough for the day’s patients at the center at any given time. This is another reason why same-day rescheduling is frowned upon. This stuff has a very short half-life and must be discarded immediately if not used – that costs a lot of money. It is housed in a tungsten container, preventing the radiation from leaking out. The nurse very carefully uses the IV line she placed in you previously to inject the solution. It may feel cold as it goes into your body. This is normal. After the injection is complete, the nurse removes your IV, turns out all the lights, gives you a warm blanket and pillow, and instructs you to lie still for 90 minutes. And they mean it. You can’t talk. You can’t read. You can’t play on your phone. You can’t move any more than is strictly necessary. And they have a very good reason for this. As the radiation goes through your body, is slowly saturates your entire bloodstream and consequently your organs and lymphatic system. If you move too much, say your fingers for instance by playing on your cell phone, you will get an abnormally high concentration of radioactive liquid in your fingertips. The reason these scans work as they do is because cancer cells are more “active” than regular cells and tend to use more blood – causing a concentration of radioactive blood that “lights up” the scan. If you move too much, you risk concentrating blood and causing a false positive on your scan. Even reading causes extra blood flow in your brain and needs to be avoided. This is also why you are urged to not work out at least 24 hours before your scan. Sore muscles that are healing themselves require more blood and run the risk of a false positive on the scan. After the radioactive liquid is injected into you, you have to sit still, in the dark, for 90 minutes. This is harder than it sounds. 90 minutes without reading a book, walking around, talking, or doing something is nearly intolerable. If possible, try to nap or listen to an iPod. You are encouraged to use the restroom as often as you need, as long as you don’t take too long doing it and come back quickly to your base resting state. After 90 minutes, which feels like an eternity, the nurse returns and flips the lights back on and you are asked to drink another 8 ounces of contrast. Then, you are led to the imaging room. I have it pictured at the top of this article. You can’t have any earrings or jewelry on for the scan. In fact, even the zipper on your pants is not allowed. I am always asked to pull my pants down below my knees since they are not scanning my lower legs). You are then strapped onto the table, feet and arms so you can’t move, and the machine is aligned. The rest is easy, as long as you don’t get a nose itch (remember, you can’t move). The CT scan comes first followed by the PET scan. The CT scan is over relatively quickly – about 5 minutes. The PET scan takes about 25-30 minutes to complete. The entire time you are not allowed to move, or even turn your head. It is vital that you lie as still as possible and breathe normally. If you are claustrophobic, you might experience some anxiety as your body moves through the scanner. I am not, so I never have any issues. Still, this must be endured if you want to find out if you still have cancer or not. The technician comes on over the speaker system every few minutes to tell you how much time you have left. This is a nice way of letting you know it’s almost over and is very calming for some people. Me, I usually end up dozing off anyway, so it doesn’t matter. Before you know it, the scan is done. You are encouraged to drink LOTS of water to eliminate the radioactive liquid and are warned to stay away from children and pregnant ladies for 12 hours. The risk is low, but it is a risk nonetheless – you could harm someone with the isotopes in your blood. After the scan, you get to go home and usually within 24-48 hours you can call your doctor or he calls you to tell you the results. Now many people have asked me if these scans are dangerous. Simply, the answer is yes, they are. Ironically enough, these scans are radioactive and I run the risk of this radiation causing some kind of cancer in my body in the future. That’s why they are only performed twice a year and then they taper off to once a year after two years. I’m not sure comparatively how much radiation I am getting bombarded with, but any radiation is a risk – even the dental x-rays we all get from time to time. The risk is worth it to me though. I need to know as early as possible if I have a recurrence. There are limits to the resolution of a CT/PET scan. Cancer survivors need to be aware of this. Typically, if a cancer malignancy is smaller than your little fingernail it will not get picked up by the scan. This is why it is important to get scans every six months initially. A cancer that was missed the first time because it was too small will show up on the next scan if it has grown. This resolution limit is very frustrating for cancer survivors because it means that we’re never certain that we are cancer free. That was my routine today. If you are a cancer survivor or caregiver who was wondering about this routine, I hope you are now enlightened and aware of what cancer survivors, myself included, go through every six months. The Binary Biker is Still Cancer-Free! I’ve known you for 15 years and never knew you were a squirter. Thanks for ths. I am undergoing treatment for colorectal cancer in Spain and have never had the procedure explained to me, so this was super helpful. Just had my last scan on Monday and it looks like the months of being back in the banal world of work, kids, and cancer-free life may be over. I hope I’ll be able to look back on all this with my grandkids and tell them how primitive medicine was when I was younger…. I’m sorry you’re having to deal with this. You’re right in that the cancer routine can easily take over your life and it’s important to remember that cancer isn’t you – and one day it will be over. I love your sentiment on how we’ll look back on these treatments. We definitely kill the patient to cure the disease when it comes to cancer – but the tools do work. I wish you the best of luck! Stay strong and feel free to find me on Facebook if you every want to chat. You’re not alone – one of my good friends has been battling colon cancer (stage 4) for 9 years and has been beating it every day. While every cancer is different – this thought gives me hope. Hi Sandy – GOOD LUCK! My sincerest hopes and wishes for a successful and speedy recovery. I have had numerous CT scans and have been with my mother as she had had numerous PET scans – this article very articulately explains EVERYTHING from the beginning to the end and I THANK YOU! Even with my past experiences I didn’t know all that you told and am better prepared for life ahead. Was just diagnosed with Diffuse Large B Cell Lymphoma that’s dumping into my thyroid and am undergoing PET scan (“full body”) tomorrow, followed by the same as CT scan the next day. I was surprised that you said they can be done following each other during same procedure. But then I’m sure my cancer center “needs” more money for research. Even so – I am thrilled to have such a renowned center close enough for me to go there for treatment! I again thank you for all your info which allows me to go in with a calmer demeanor. Thanks so much for your response and energy! I hope you continue to have good health!